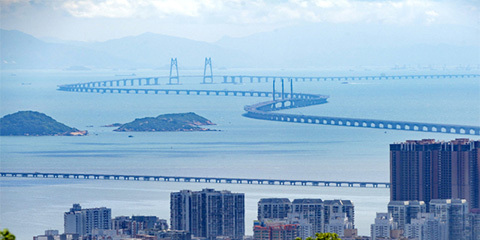 An innovation index has been published to track the performance of companies based in the Guangdong-Hong Kong-Macao Greater Bay Area. The index, which was released by Shenzhen Securities Information Co., Ltd. and the China Center for Information Industry Development Tuesday, is based on 100 stocks covering advanced manufacturing, strategic emerging industries, modern services and maritime economy. The innovation index, including shares of industry giants such as Tencent, Ping An, Gree and Midea, is the flagship of a series of indexes for the Greater Bay Area to be developed by the two parties. It contains 38 information technology enterprises that account for over 25 percent of weighting. A composite index for the area was also launched at the same event Tuesday. All the indexes are based on equities listed at the Shenzhen, Shanghai and Hong Kong exchanges that are eligible for the Stock Connect programs. The Stock Connect are securities trading and clearing arrangements that link China's mainland stock exchanges to that of Hong Kong. The programs allow mainland investors to trade and settle shares in the Hong Kong market via their local exchanges, and vice-versa. The Greater Bay Area has a highly developed capital market. By the end of March, it had more than 750 companies that were listed on Chinese mainland and eligible under the Stock Connect programs with a total market capitalization of nearly 27 trillion yuan (about 4 trillion U.S. dollars). The index series would play an important role in developing the area into an international science and innovation center and enhancing the financial sector's service to the real economy, said an official with the Shenzhen Stock Exchange.